Would you like to find out the secret of male fertility, into a ripe old age? 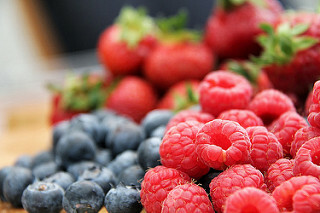 Antioxidants could have a lot to do with it, a new study says! For more specific information, you may also like to read about food sources of folic acid, and zinc rich foods for better fertility. Previous research has already revealed that antioxidants improve fertility for both sexes. Now a new study published in the journal Fertility and Sterility specifically found that those men over 45 who had the highest levels of antioxidants had the fewest DNA-strand breaks in their sperm. In other words, the genetic quality of older men's sperm is better if they get enough zinc, folate, and vitamins C and E. Of course, eating better improves a person's general health, and with that also their fertility. But the study's senior researcher Andrew J Wyrobek of the Lawrence Berkeley National Laboratory in California said that it was definitely the antioxidants themselves that made the difference in the genetic quality of men's sperm. Eighty healthy, non-smoking guys between the ages of 22 and 80 participated in the study. Besides generously donating a sperm sample, they also answered questions about their diet and dietary supplements. In the 45+ group, those men who had the highest vitamin C intake had 20 percent less DNA damage to their sperm than those who got less of the vitamin. Other antioxidants showed the same pattern, although the difference was not quite as drastic. Wyrobek said that it is only adequate amounts of these antioxidants that male the difference, and that consuming larger amounts does not decrease the DNA damage any further. He also warned that there are many possible causes of male infertility, and cautioned couples against thinking that antioxidants could be a miracle cure. He did say that it makes sense to include these vitamins and minerals in your diet: "This suggests that if you're an older man who's planning on having children in the future, you could think of your diet as part of that overall plan." Comments and reviews on article "How to Increase Sperm Count and Improve Sperm Quality Naturally"